This past weekend was a momentous occasion. 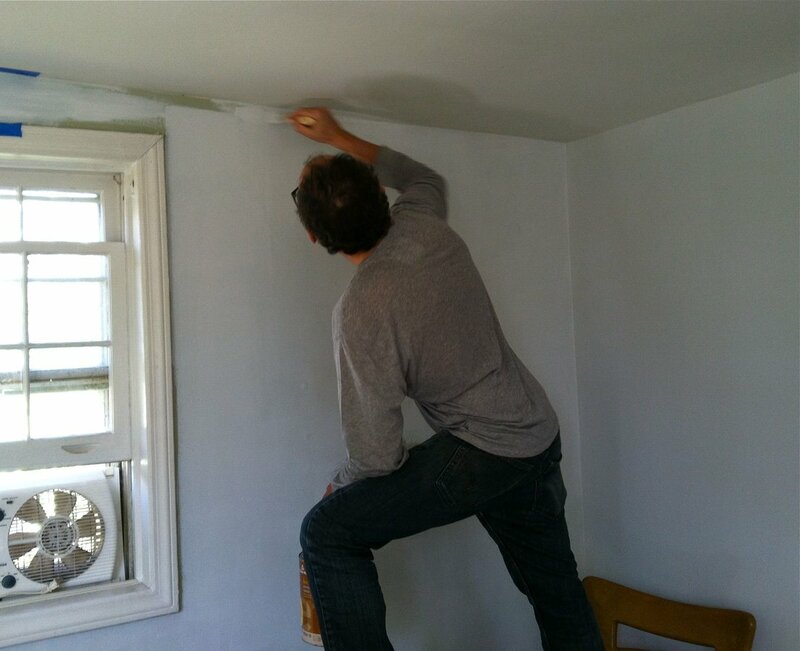 We were asked to help with the fixing up of the oldest daughter’s first grown-up apartment. The request was simple, “Help me make it look not like a dorm room”. 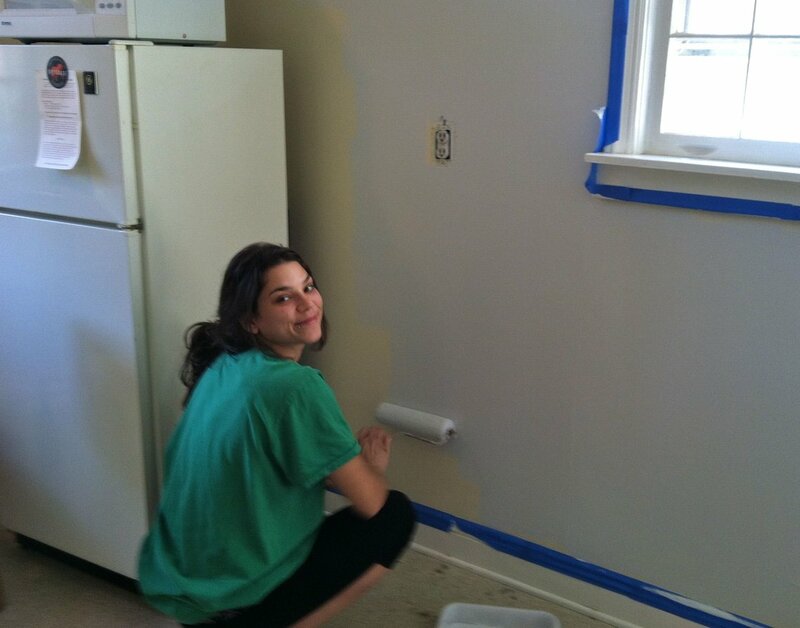 She asked for advice with picking out paint colors, and then we went one better and went to help her paint. I started by taking some photos of the small apartment and used my Color Capture app to illustrate my ideas. The entryway was the jumping off point to the color scheme because the most striking feature of the apartment is there – beautiful tall windows that are edged with yellow and green stained glass squares. I thought she should put most saturated color there because the apartment has very low ceilings, and though it is sunny in the living room, the windows are rather small. A saturated color in the entryway would be an interesting highlight and would not be oppressive in the small space. A green for the entryway would bring in the outdoor foliage and the colors of the stained glass in the windows. I suggested a un-babyish blue for the living room so that the room would feel expansive and sophisticated. The kitchen counter is yellow and the backsplash is grey tile. 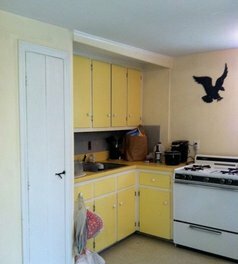 The existing color for the cabinets was a yellow that made them the focal point of the room when they shouldn’t have been. 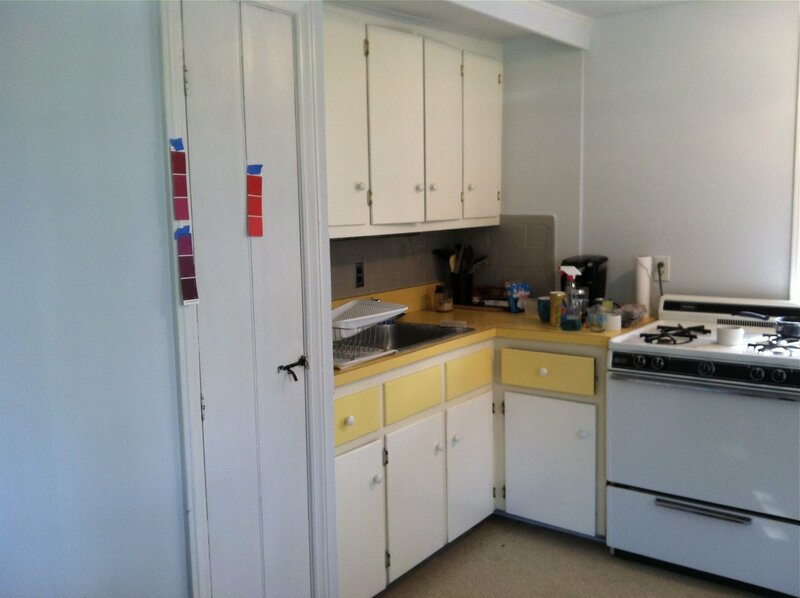 I thought a light color would make the cabinets recede and make the kitchen look clean and neat. I sent Camelia some samples I made with the Color Capture app and some paint chips look at in the light of the apartment. Using my general direction but making her own choices, Camelia picked beautiful colors. She picked Benjamin Moore’s Silver Cloud for the living room/kitchen. It is a luminescent greyish blue color that changes with the light and made the room look soothing and fresh. In the late afternoon sun, a wall might look white one place, a soft grey or blue in another – an interesting chameleon-like color. The white trim of the windows looked crisp against it even though they had not been repainted. 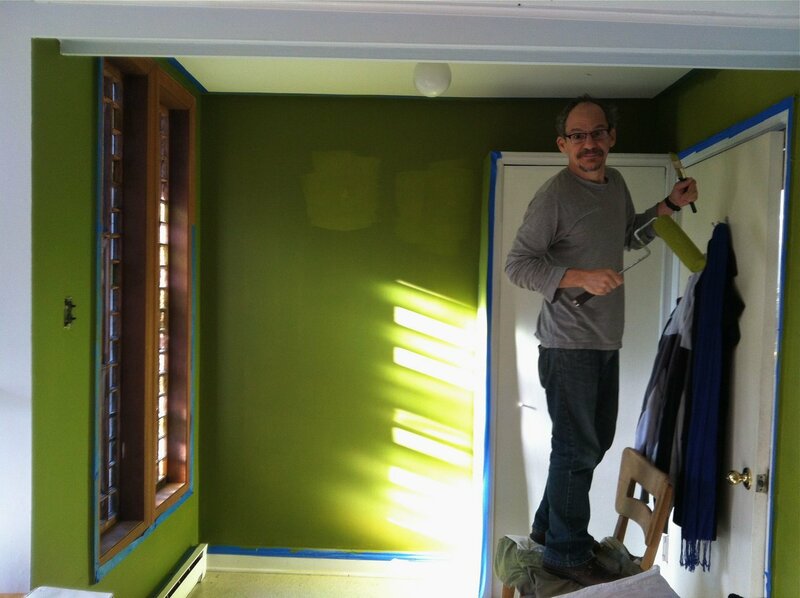 For the entryway, she chose a mossy green, Benjamin Moore’s Dark Celery. The kitchen cabinets were painted in a luscious creamy color. 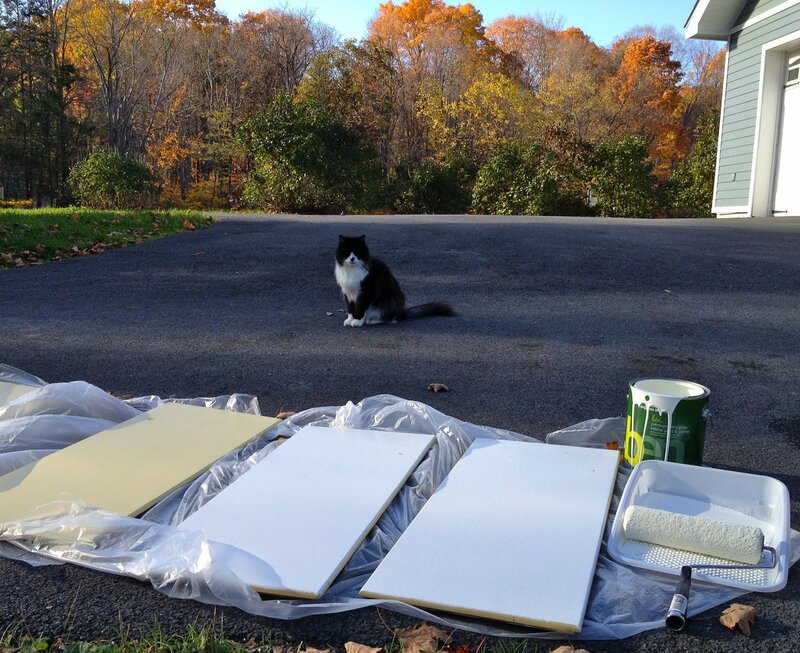 It was beautiful to see the paint brushstrokes of the color that is so aptly named Bavarian Cream. We painted together and laughed and went out to dinner and watched a late movie and then slept over in our daughter’s first grown-up apartment. This entry was posted in our revamping and home design and tagged benjamin moore bavarian cream, benjamin moore dark celery, benjamin moore paint, benjamin moore silver cloud by ileana. Bookmark the permalink. 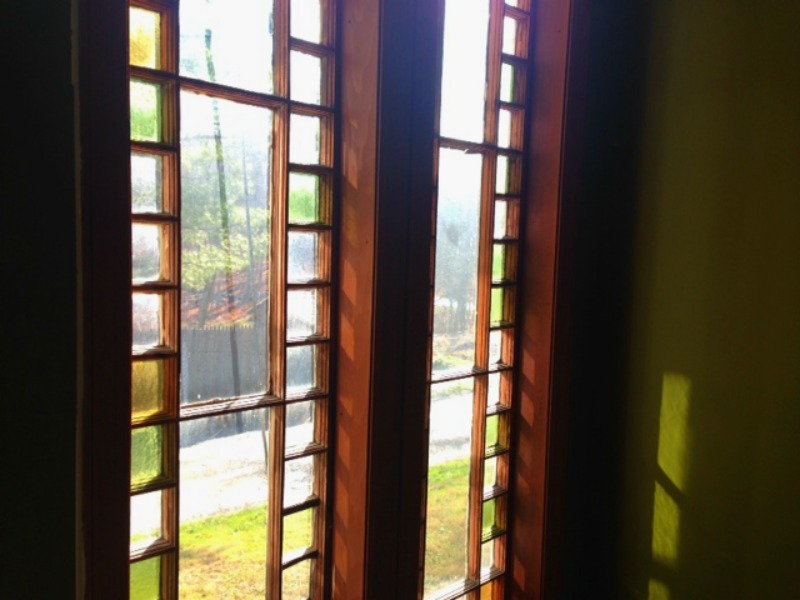 A sunny room with stained-glass windows that one can paint a dark celery color! It’s like a dream! Congrats!